LA UNION, Colombia (AP) — Colombian authorities searched for answers Tuesday into the crash of a chartered airliner that slammed into the Andes mountains while transporting a Brazilian soccer team whose Cinderella story had won it a spot in the finals of one of South America's most prestigious regional tournaments. All but six of the 77 people on board were killed. The British Aerospace 146 short-haul plane declared an emergency and lost radar contact just before 10 p.m. Monday (0300 GMT Tuesday), according to Colombia's aviation agency. It said the plane's black boxes had been recovered and were being analyzed. The aircraft, which departed from Santa Cruz, Bolivia, was carrying the Chapecoense soccer team from southern Brazil for Wednesday's first leg of the two-game Copa Sudamericana final against Atletico Nacional of Medellin. Twenty-one Brazilian journalists were also on board the flight. Colombian officials initially said the plane suffered an electrical failure but there was also heavy rainfall at the time of the crash. Authorities also said they were not ruling out the possibility, relayed to rescuers by a surviving flight attendant, that the plane ran out of fuel minutes before its scheduled landing at Jose Maria Cordova airport outside Medellin. Whatever the cause, the emotional pain of Colombia's deadliest air tragedy in two decades was felt across the soccer world. Expressions of grief poured in as South America's federation canceled all scheduled matches in a show of solidarity, Real Madrid's squad interrupted its training for a minute of silence and Argentine legend Diego Maradona sent his condolences to the victims' families over Facebook. 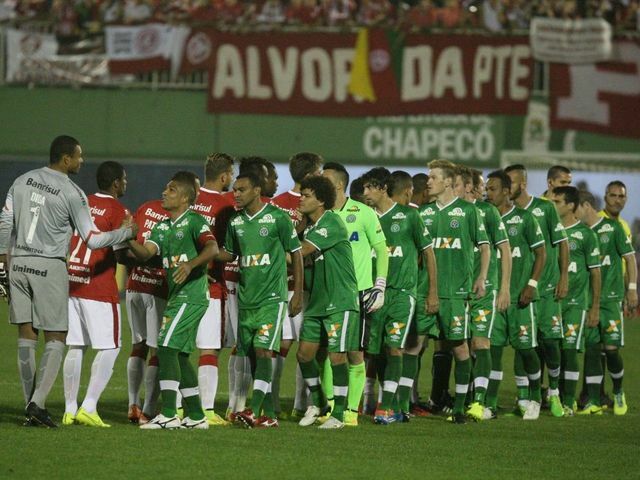 Brazil's top teams offered to loan the small club players next season so they can rebuild following the sudden end to a fairy tale season that saw Chapecoense reach the tournament final just two years after making it into the first division for the first time since the 1970s. "It is the minimum gesture of solidarity that is within our reach," the teams said in a statement. Sportsmanship also prevailed, with Atletico Nacional asking that the championship title be given to its rival, whose upstart run had electrified soccer-crazed Brazil. Rescuers working through the night were initially heartened after pulling three people alive from the wreckage. But as the hours passed, heavy fog and stormy weather grounded helicopters and slowed efforts to reach the crash site. At daybreak, dozens of bodies scattered across a muddy mountainside were collected into white bags. They were then loaded onto several Black Hawk helicopters that had to perform a tricky maneuver to land on the crest of the Andes mountains. The plane's fuselage appeared to have broken into two, with the nose facing downward into a steep valley. Officials initially reported 81 people were on board the flight, but later revised that to 77, saying four people on the flight manifest did not get on the plane. Images broadcast on local television showed three of the six survivors on stretchers and connected to IVs arriving at a hospital in ambulances. Chapecoense defender Alan Ruschel was in the most serious condition, and was later transported to another facility to undergo surgery for a spinal fracture. Teammates Helio Zampier and Jakson Follmann also suffered multiple trauma injuries, with doctors having to amputate the goalkeeper Follmann's right leg. A journalist traveling with the team was recovering from surgery and two Bolivian crew members were in stable condition, hospital officials said. The aircraft is owned by LaMia, a charter company that started off in Venezuela but later relocated to Bolivia, where it was certified to operate last January. Despite such apparently limited experience the airline has a close relationship with several premier South American squads. Earlier this month, the plane involved in Monday's crash transported Barcelona forward Lionel Messi and the Argentina national team from Brazil following a World Cup qualifier match. The airliner also appears to have transported the national squads of Brazil, Bolivia and Venezuela over the last three months, according to a log of recent activity provided by Flightradar24.com. Before being taken offline, LaMia's website said it operated three 146 Avro short-haul jets made by British Aerospace, with a maximum range of around 2,965 kilometers (1,600 nautical miles) — about the same as the distance between Santa Cruz and Medellin..
Hans Weber, a longtime adviser to U.S. aviation authorities, said the aircraft's range deserves careful investigation. He noted that the air distance between cities is usually measured by the shortest route but planes rarely fly in a straight line — pilots may steer around turbulence or change course for other reasons. Given the model of the plane and that it was flying close to capacity, "I would be concerned that the pilots may have been cutting it too close," Weber said. Bolivia's civil aviation agency said the aircraft picked up the Brazilian team in Santa Cruz, where the players had arrived on a commercial flight from Sao Paulo. Spokesman Cesar Torrico said the plane underwent an inspection before departing for Colombia and reported no problems. "We can't rule out anything. The investigation is ongoing and we're going to await the results," said Gustavo Vargas, a retired Bolivian air force general who is president of the airline. Colombian authorities said they hope to interview the Bolivian flight attendant who relayed the fuel concerns on Wednesday. Moments before the flight departed, the team's coaching staff gave an interview to a Bolivian television station in which they praised the airline, saying it brought them good fortune when it flew them to Colombia last month for the championship's quarterfinals, which they won. "Now we're going to do this new trip and we hope they bring us good luck like they did the first time," athletic director Mauro Stumpf told the Gigavision TV network. The team, from the small Brazilian agro-industrial city of Chapeco, was in the midst of a breakout season. It advanced last week to the Copa Sudamericana finals after defeating some of the region's top teams, including Argentina's San Lorenzo and Independiente, as well as Colombia's Junior. The team won over fans across Brazil with its spectacular run to the finals, with some even taking up a campaign online to move the final match to Rio de Janeiro's iconic Maracana stadium, where the 2014 World Cup finals were played. The tragedy of so many young and talented players' lives and dreams cut short brought an outpouring of support far beyond Brazil's borders. Atletico Nacional said in a statement it was offering its title to the team, saying the accident "leaves an indelible mark on the history of Latin American and world soccer." "This morning I said goodbye to them and they told me they were going after the dream, turning that dream into reality," Chapecoense board member Plinio De Nes told Brazil's TV Globo. "The dream was over early this morning."